A welcome return for one of adventure gamings patron designers, if not quite a glorious return to form. 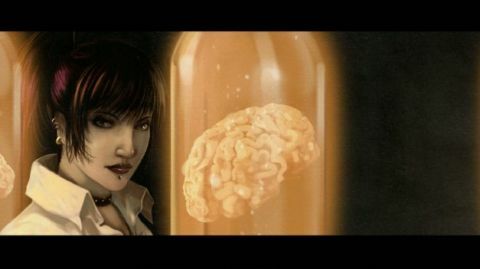 The main reason everyone's been looking forward to Gray Matter is that its creator, Jane Jensen, was the designer behind the Gabriel Knight series – two of the most beloved non-comic graphic adventures ever, and also Gabriel Knight 3. Let's get this out of the way right now. Gray Matter is not Gabriel Knight 4. In any way. Frankly, if you didn't know Jensen and co were behind it when you started playing, you'd be tipped off more by the music than anything else. Luckily, it's a game that more than stands alone. It's easily the best serious adventure in ages. It looks gorgeous, the music is terrific, and the story – while very slow – is interesting. And it's formed around a smart and engaging theme. It pits spirituality vs rationalism, as represented by Dr Stiles, a cranky neurobiologist desperate to contact his dead wife, and Sam, a street magician who scams her way into becoming his assistant, convinced the weirdness surrounding him is down to a fellow performer playing cruel pranks. When you get to the actual puzzles, far too many are simply about clicking everything until something triggers, while the bulk of the rest involve heading to the local magic shop, buying something, then distracting someone with a cheap trick. To pad this out, Sam spends as much time on solving long-winded but embarrassingly easy puzzle boxes, while the final chapter ends up so stuck for inspiration that it practically dumps her into Wonderland just to put some space between revelations. Even at its most cryptic and involved, Gray Matter seriously struggles to be a game, not simply a story. What saves all this is that the writing itself is excellent. Sam and Stiles don't spend much time together, but their interactions are always great fun. The story hits some terrific emotional beats, especially when it comes to both characters' isolation: Stiles' loneliness after his wife's death having turned in on itself, and Sam's difficulty dealing with people without being a (wellmeaning) con-artist make them both far more interesting than the average game protagonists. They deserve another outing. Gray Matter definitely isn't a sit-up-and-take-notice game like the Gabriel Knights were on release, and as an adventure, it's only mediocre. It's still an absorbing game, however, if not the one you may have wanted.